Ladies, is the pain worth the gain? Wearing high heels may seem like a necessity, but it can take a surprising toll not only on your feet, but on the rest of your body. The way you stand in high heels distorts your normal posture. Over-exaggerating certain postures while walking or standing on stable or unstable ground can stretch back muscles and add forces to your spine, joints, and discs. Certain junky foods can cause inflammation which can lead to arthritic pain, complaints about food intolerance or cause gastrointestinal discomfort. But if you are a frequent sufferer of back pain, fried foods, fatty meats, and diets rich in processed sugar could cause an unusual amount of inflammation. Healthier foods such as lean meat, fish, dark berries and cherries, tofu, some whole grains, and vegetables can make a difference. Try it out for several weeks and see if your pain subsides. Wearing skinny jeans or other tight clothing restricts your movement and compresses the tissues in your back. This can cause back pain. Style over comfort may not be the best option if you are always in pain. Sitting for long periods of time can trigger back pain. 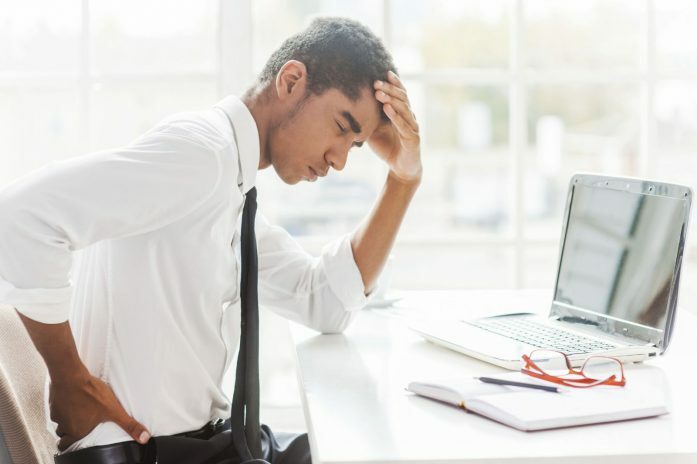 While sitting may be seem comforting to an aching back, stretching regularly and doing physical activity is healthier and may prevent future back pain. Believe it or not, 70% of us spend more than 5 hours just sitting at a desk every day. Make sure you get up every hour and walk for a couple of minutes, get a comfortable chair with support, and make sure the computer monitor is positioned at the correct height. Exercising your core abdominal muscles may be the answer. Your posture and metabolism rely on a strong core. Physical therapists work with back pain patients to stabilize and strengthen the core. Having a strong core also leads to better posture, which results in less back pain. It’s all related! If you find that the above suggestions are not helpful, then you may suffer from spine disease. In fact, pain arising from the disc (discogenic pain) causes the majority of chronic low back pain. There can be many other sources though, like pain from the stabilizing joints of the spine (facet joints), sacroiliac joints, or muscles. If your back pain persists for 3 months or more, consider an evaluation by your primary care doctor or pain specialist. Think about whether these possible sources of back pain may be affecting you. Some are easy to fix like tight clothes or high heels, and others require the expertise of a pain physician for diagnosis and treatment. Even differences in the length of our legs (leg length discrepancy) can lead to hip or back pain. Don’t wait too long if the pain persists. Seek some help from your doctor. Posted in Back Pain, Blog, In the News, Top Pain Reliefs.